The 5¢ Type I Red Brown Imperforate was issued sometime in the first quarter of 1856. 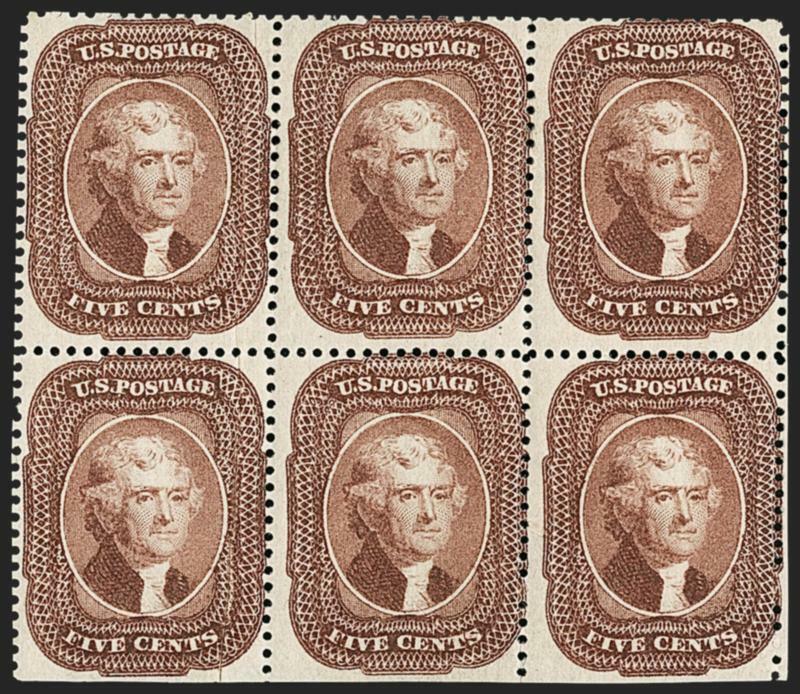 It seems likely that all of the stamps distributed to post offices were from the initial print run of 600,000 made by Toppan Carpenter at their Philadelphia plant, because there is virtually no variation in the Red Brown shade of the imperforate stamps. In 1857 the Post Office began issuing perforated stamps for all denominations, and they started by perforating the existing stock of imperforate sheets on hand. 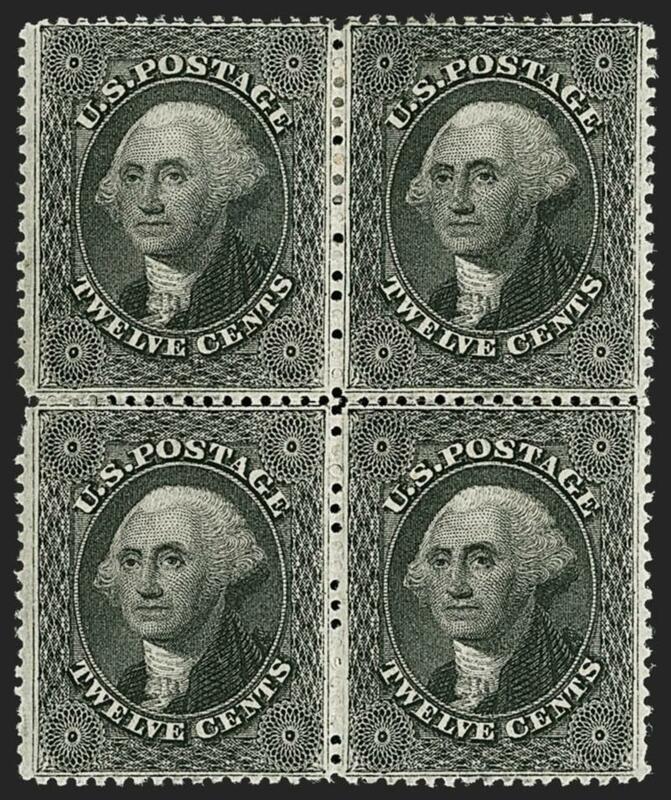 In the case of 1¢ stamps, the use of old stock produced perforated versions of stamps printed from plates associated with imperforate issues--Plates 1L, 2 and 4--and collectors can readily identify those early perforated stamps by their plate characteristics. However, since only one plate was used to print 5¢ Type I stamps, something other than plate criteria must be used to identify perforated stamps made from imperforate stock. The key is the color shade. 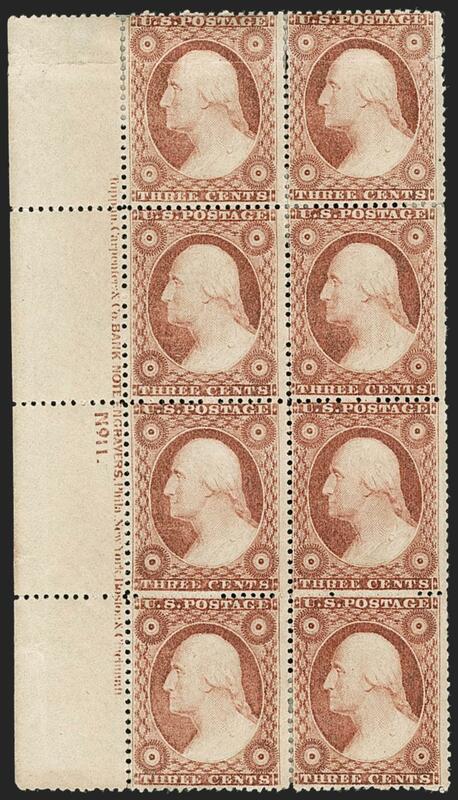 The photograph at left shows the four Red Brown shades associated with 5¢ Type I Perforated stamps. 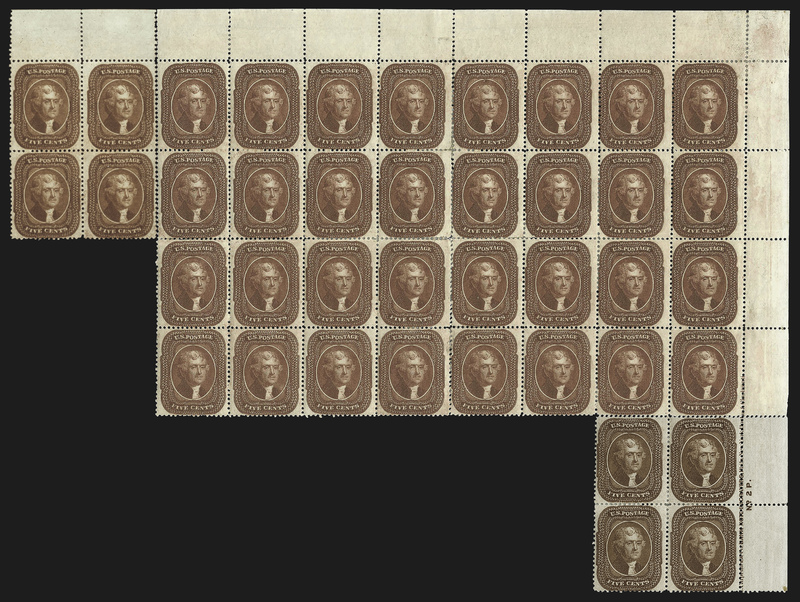 The 1856-57 Red Brown at the far left and the 1858 Red Brown to its right are both listed under Scott 28, but they represent two different printings--the block offered here is the 1856-57 shade. The Bright Red Brown, Scott 28b, is really just an intermediate shade from the 1858 printing, with the regular Red Brown, Scott 28, at the lighter end of the spectrum, and the Indian Red, Scott 28A, at the more intense end. The Brown shade, which has no red or orange hue, was the last printed from the original 5¢ plate, which had the full Type I design. 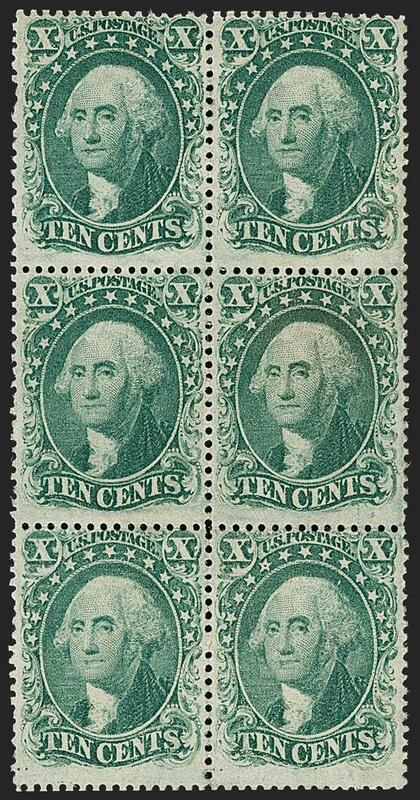 Beginning in 1860, the trimmed reliefs were used, producing Type II stamps (Scott 30A and 30). 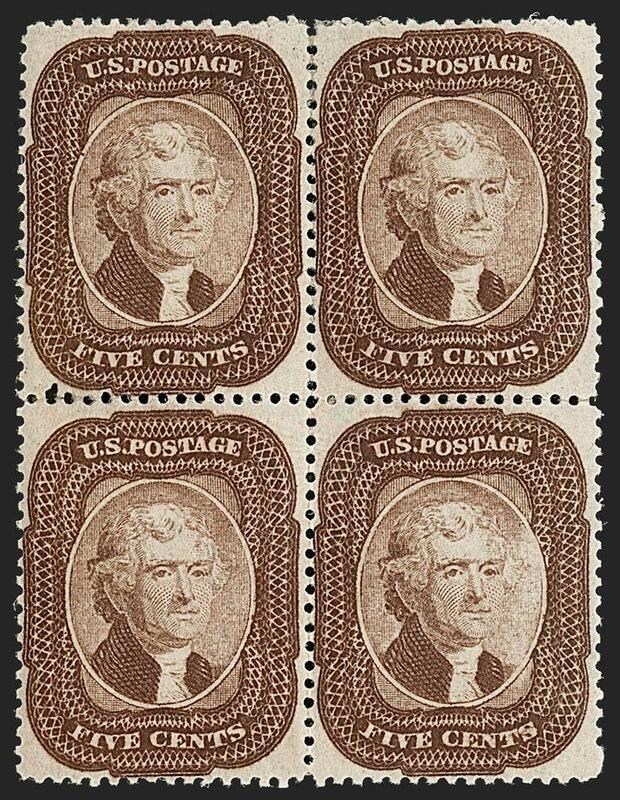 The first 5¢ Jefferson stamps were produced by Toppan Carpenter sometime in the first quarter of 1856. The 1856 Issue was imperforate and produced from the first plate with the full design (Type I). In 1857 the Post Office began issuing perforated stamps for all denominations, and they started by perforating the existing stock of imperforate sheets on hand. Looking at the earliest documented uses of the perforated 5¢ stamps issued from 1857 to 1861, there is a largely consistent pattern of new 5¢ printings at the beginning of each year. Printings from Plate 1 were made in 1858 (Red Brown) and 1859 (Brown); then in 1860 a new plate was made from a transfer roll with the design shortened at top and bottom--Type II. 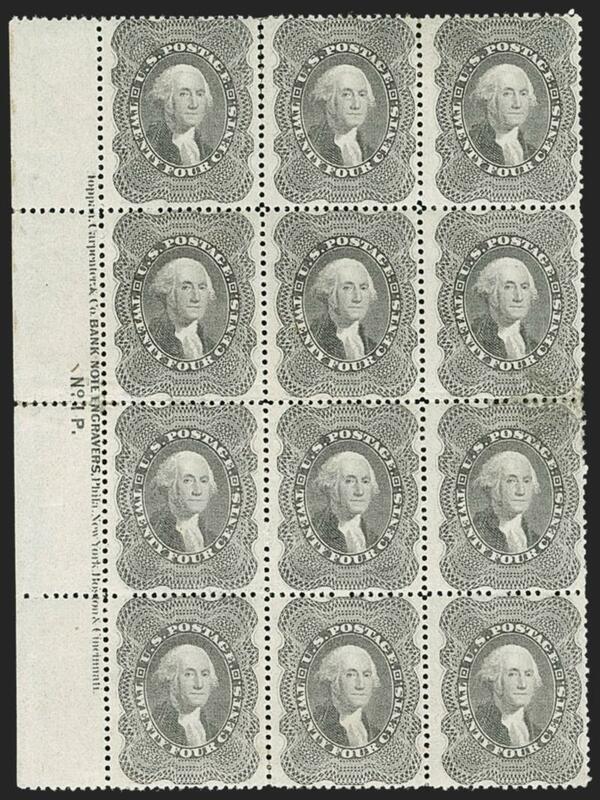 Plate 2 was used to print more 5¢ stamps in 1860 (Type II Brown) and 1861 (Type II Orange Brown). The Scott Catalogue transposes the chronological order of the Type II issues, with the Orange Brown listed first as Scott 30, followed by the Brown, Scott 30A. Although a relatively large number of 5¢ Orange Browns reached collectors from unused supplies left over after the issue was demonetized due to the Civil War, multiples are scarce, and most have been broken to feed the market's desire for singles. The largest recorded multiple is a block of 32 from the upper right corner of Plate 2 (Positions 3-10/13-20/23-30/33-40R2) with corner sheet selvage. The plate block of four was detached from this block of 32, probably sometime before World War II, but at least by 1955 when the plate block appeared in the Waterhouse sale--the block of 32 appeared in the Caspary sale in 1956. Another block of four, with the top sheet margin, comes from Positions 1-2/11-12R2 in the original sheet. The three multiples are shown together in the digital reconstruction at left. Beginning with the printing in the first quarter of 1860, a new plate of 200 subjects, divided into left and right panes of 100, was used by Toppan Carpenter to print 5¢ stamps. The siderographer followed the same procedure used to make the 1¢ Plates 5 through 10, in which a 6-relief transfer roll was modified by trimming the designs to reduce the stamps' dimensions. For the 5¢, the top and bottom of the design were trimmed from the reliefs, which distinguishes Type II from the earlier Type I. Entries on the plate were made from the transfer roll in vertical columns, ten to a column--when completed there were 10 columns and 10 rows in each half of the plate, separated by a centerline. Row 1 of the 5¢ plate was entered with the A Relief, followed by the B, C, D, E and F Reliefs for rows 2, 3, 4, 5 and 6. The progression resumed with the C Relief for row 7, followed by the D, E and F Reliefs for rows 8, 9 and 10. The new 5¢ plate made from the 6-relief transfer roll with trimmed reliefs--the clipped projections at top and bottom distinguish Type II from the earlier Type I design--was used to print stamps in Brown in 1860 and in Orange Brown in 1861. 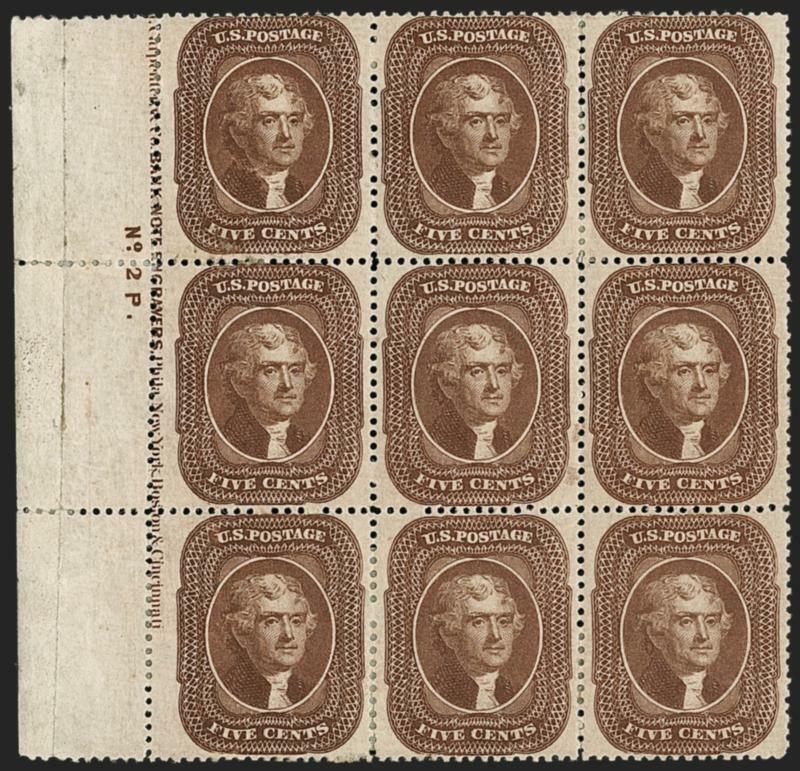 Since there were few Type II Brown sheets on hand in 1861 when the issue was demonetized due to the Civil War, it is much scarcer than the Orange Brown in unused condition, and unused blocks are exceedingly rare. 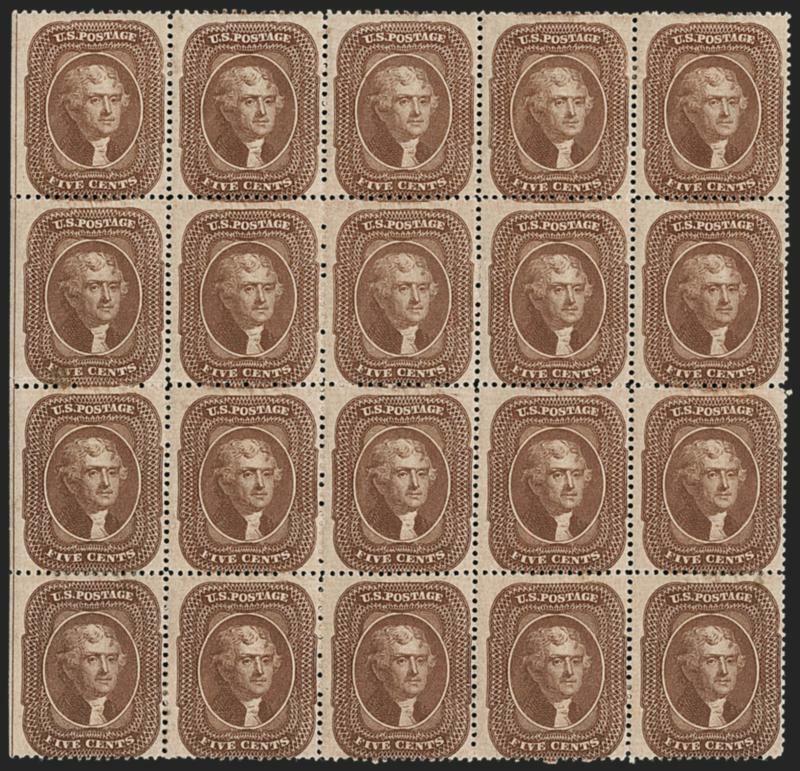 Prior to the emergence of this block of 20 in 2012, when the long-dormant Frelinghuysen collection came to market through Siegel, the largest multiples of the Type II Brown were the two plate number blocks of nine, one of which is offered in this sale as lot 43. In May 1860 President Buchanan's postmaster general, Joseph Holt, issued a new order requiring prepayment by stamps on transient printed matter, and on all foreign and domestic mail, except letters permitted to be sent unpaid by international postal conventions. Holt's order sparked public demand for stamps, especially in denominations greater than 12¢, the top value in circulation at the beginning of 1860. In response, the Post Office issued the three top values of the series that started in 1851. The 24¢ design had already been submitted for approval in April 1856, and the 24¢ plate was produced in 1857 or 1858, but the stamps were not issued until June 1860. In July-August 1860 the 30¢ and 90¢ designs were approved, the plates were made, and the stamps were issued in August of that year. About fifteen months later, in the fall of 1861, the federal government demonetized all previous issues of postage stamps and replaced them with new stamps that would be distributed only to post offices in loyal states. The purpose of demonetization was to prevent the South from using stamps as a medium of exchange. The demand for the high-denomination stamps in 1860 was limited, and the Civil War demonetization policy cut their lives short. 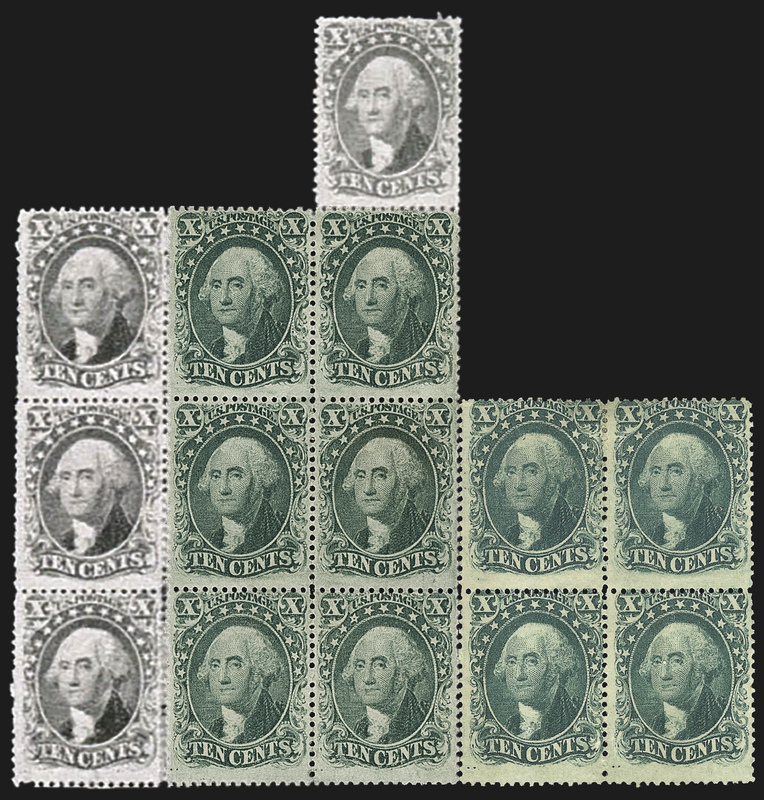 Unused examples would be great rarities today if not for a cache of sheets discovered in Washington, D.C., which had been found in Southern post offices after the war and returned to the Post Office. These sheets were sold and traded to stamp dealers, and many of the unused stamps from late pre-war printings come from this source. Despite the survival of unused high-denomination remainders, multiples with the imprint and plate number selvage are extremely rare. Philatelists record only two 24¢ plate blocks and one each of the 30¢ and 90¢. 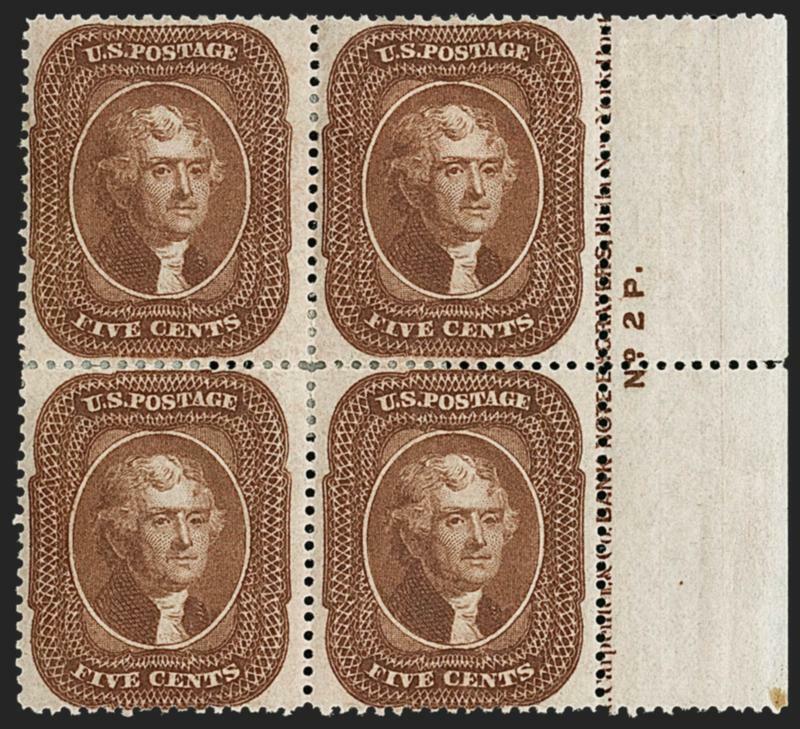 All four blocks are offered in this sale of the Gross collection. In April 1856 Toppan Carpenter sent a die proof of "the new 24¢ stamp" to Third Assistant Postmaster General John Marron for official approval. The printers described the 24¢ engraving as "entirely original in lathe work" and "as perfect a piece of geometric lathe work as can be produced." Other correspondence indicates that the design was approved and the plate was manufactured in 1857 or 1858, but no 24¢ stamps were produced until 1860. In May 1860 President Buchanan's postmaster general, Joseph Holt, issued a new order requiring prepayment by stamps on transient printed matter, and on all foreign and domestic mail, except letters permitted to be sent unpaid by international postal conventions. Holt's order sparked public demand for stamps, especially in denominations greater than 12¢, the top value in circulation at the beginning of 1860. In response to a letter received from the Philadelphia postmaster, the new Third Assistant Postmaster General, Alexander N. Zevely, contacted Toppan Carpenter about producing new high-denomination stamps. 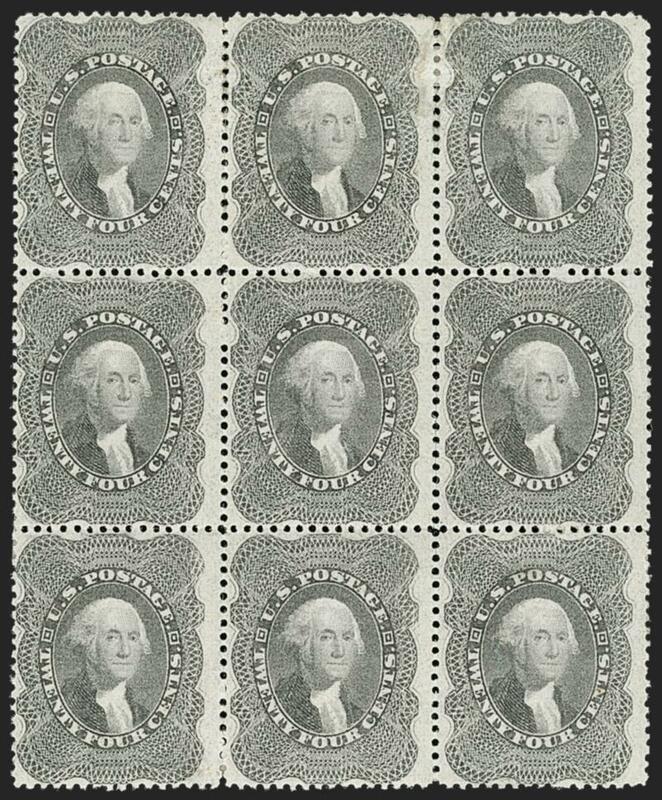 The printers responded that they could furnish stamps within three weeks of the order being received, which they were able to do since they already had the 24¢ plate from two years earlier. Zevely ordered 24¢ stamps in a "lilac" shade, and the firm stated that they would be ready by June 15, 1860. The earliest documented use is July 7, 1860. Five months after the 24¢ was issued, in November 1860, an Illinois lawyer and one-time U.S. congressman named Abraham Lincoln was elected president on a Republican platform dedicated to preserving the Union and to laying the foundation for the eventual abolition of slavery. It was too much for the South. On December 20, 1860, South Carolina formally voted to secede from the Union, and other slave states soon followed. By April the first guns of the war were fired on Fort Sumter during Lincoln's "I dare you" attempt to resupply the fort. The 24¢ stamps issued in June 1860 were one of the war's early casualties. In August 1861 the federal government demonetized all previous issues of postage stamps and replaced them with new stamps that would be distributed only to post offices in loyal states. The purpose of demonetization was to prevent the South from using stamps as a medium of exchange. Demand for the high-denomination stamps in 1860 was limited, and the Civil War demonetization policy cut their lives short. Unused examples would be great rarities today if not for a cache of sheets discovered in Washington, D.C., which had been found in Southern post offices after the war and returned to the Post Office. These sheets were sold and traded to stamp dealers, and many of the unused stamps from late pre-war printings come from this source. Possibly Henry C. Gibson, Sr.